Thursday was supposed be the warmest day of the four days we were in LA. Dustin and I had decided earlier in the week that we would head to the beach to take advantage of the nice weather. All four days were nice, so I’m really just splitting hairs here. We got most everything ready for when we had to leave for the game, so we could just come back, shower, and leave for the game. We left Simon’s at 11:05, and it took us 59 minutes to travel 27 miles. I know LA traffic is bad, but I wasn’t expecting it to be so bad at 11 am on a Thursday. We went to the Santa Monica State Beach Park, and we chilled by the Pacific for two and a half hours, and then decided it was time to head back. Dustin hadn’t seen the Pacific since we were there in 2004, so it was something he had wanted to do. 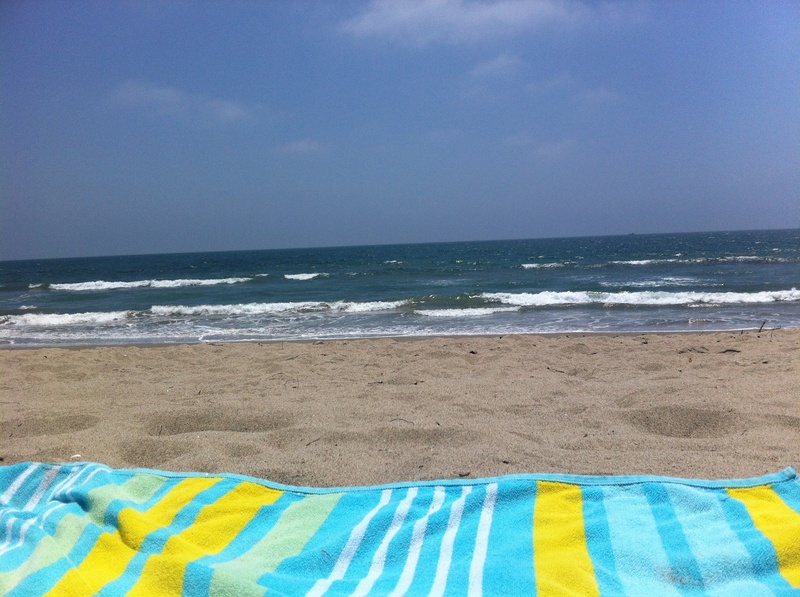 I was somewhat indifferent because I was just on the beach in San Diego just four weeks prior, but I’m glad we went, because it was quite relaxing. We got back to Simon’s place at 3:45, and started getting ready for the game. We hadn’t gotten lunch yet, and were planning on stopping somewhere on our way to the game. At 4:34 I got a call from a number I didn’t recognize, and it said “Northern Los Angeles Area” below the number. I didn’t feel my phone vibrating until the last second, so I missed the call but called back right away, and I’m glad I did. Joe Braun, Ryan’s dad, was on the phone and asking if Dustin and I needed tickets for the game. 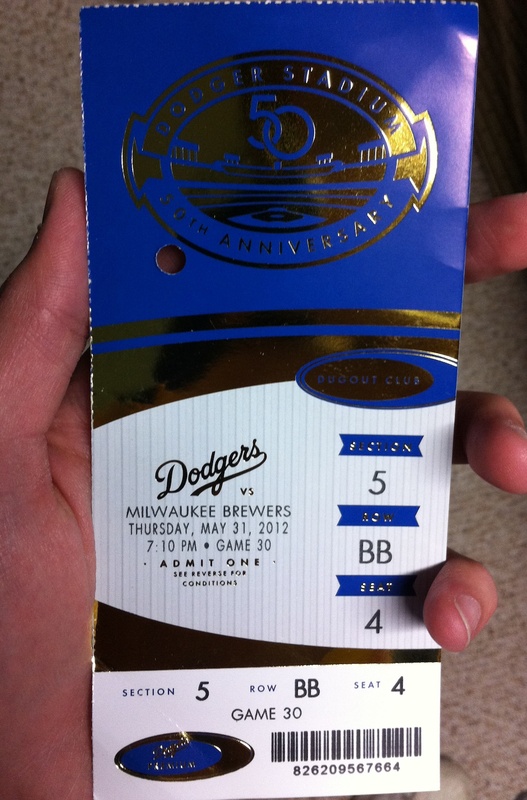 He said they were second row, right behind home plate, and were in one of the Dugout Club sections. I don’t know if he could sense it in my voice, but I was ecstatic. I think I used the word amazing a few times in our brief conversation. I graciously accepted and agreed to meet outside the Club level entrance, where Dustin and I had caught up with him the day before. We were both really pumped, and couldn’t wait to get to the stadium. We left after my conversation with Joe, and we were parked by 5:13. We met up with Joe and Diane (Ryan’s mom), shortly thereafter and Joe gave us our tickets (I wonder if it’s real gold, haha). We headed inside and I told them that I had to get my game number picture taken in the upper deck, and we parted ways as they went down to the field level. 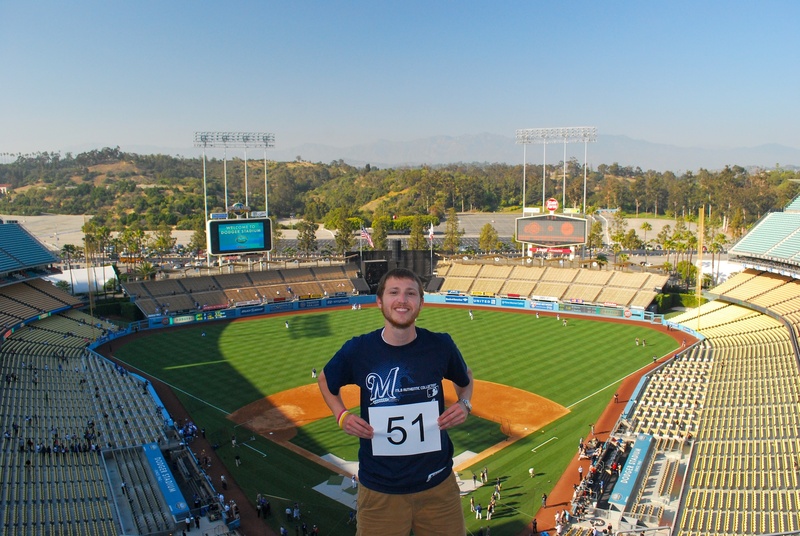 Dustin and I spent about 15 minutes in the upper (top) deck, and got a good game number 51 photo. We walked around a little bit up there and took some photos. 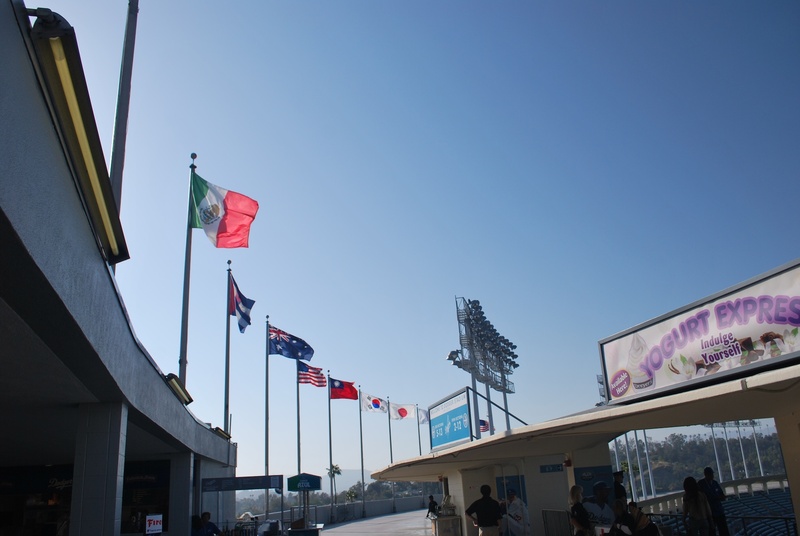 This first one is of the top deck concourse, with various country’s flag waiving. 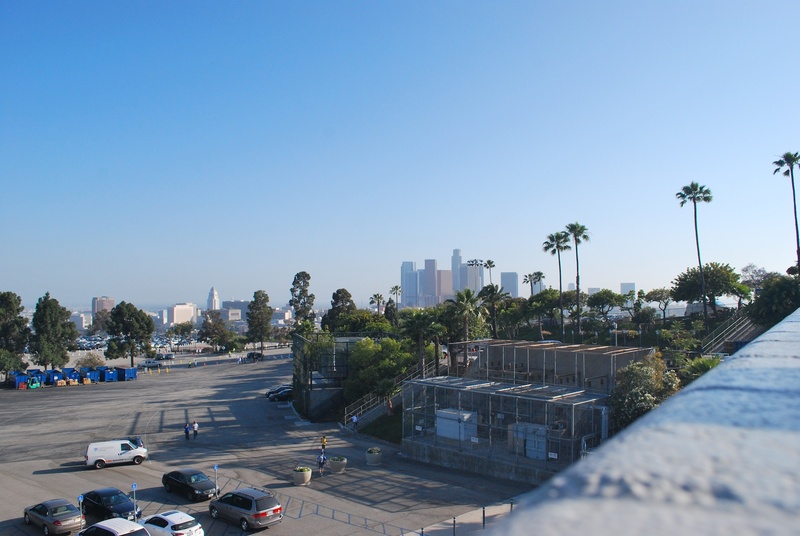 The second one is the view from the concourse, looking over the waist-high wall towards downtown Los Angeles. The last one is a view of the field, as seen from the edge of the top deck. 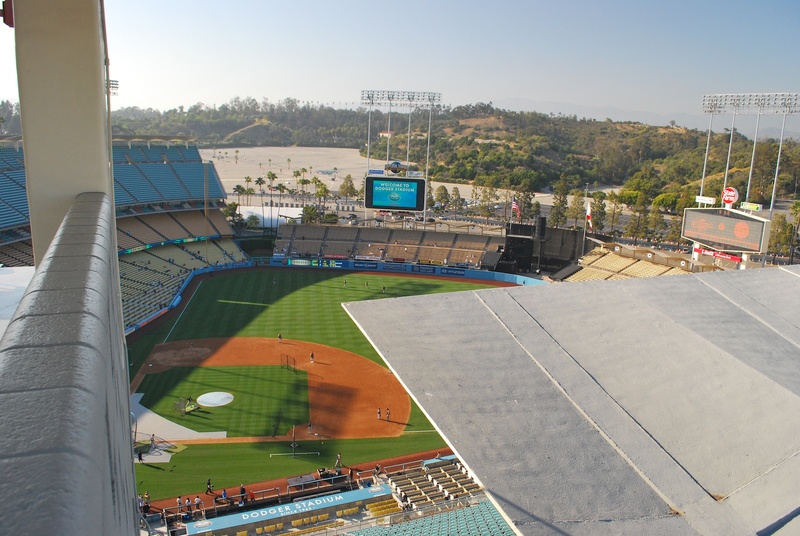 The top deck doesn’t go all the way to the foul poles, and you can see the roof of the reserve level taking up the lower right side of the picture. After taking some photos we took the two elevators required to get down to the field level. Behind home plate there’s a glass-enclosed stairwell that leads you down to the Dugout Club. The four-part picture below illustrates (to some degree) what it’s like down there. 1) The stairwell wall after entering the Dugout Club on the field level. 2) After going down the stairs you have entrances to both the visiting and home clubhouses. Pictured is the Dodger’s Clubhouse entrance. The entrances are literally 40 feet from each other, and Prince Fielder famously tried to get at a Dodger’s reliever (cough-Guillermo Mota-cough) after Mota beaned him back in 2009. Having the two entrances so close may not have been the best idea. 3) After going down another set of stairs you have the dining area. This picture doesn’t do it justice, and it was taken in a hurry with my iPhone when I was hustling back from the bathroom during the game. 4) An example of the food they have down there. 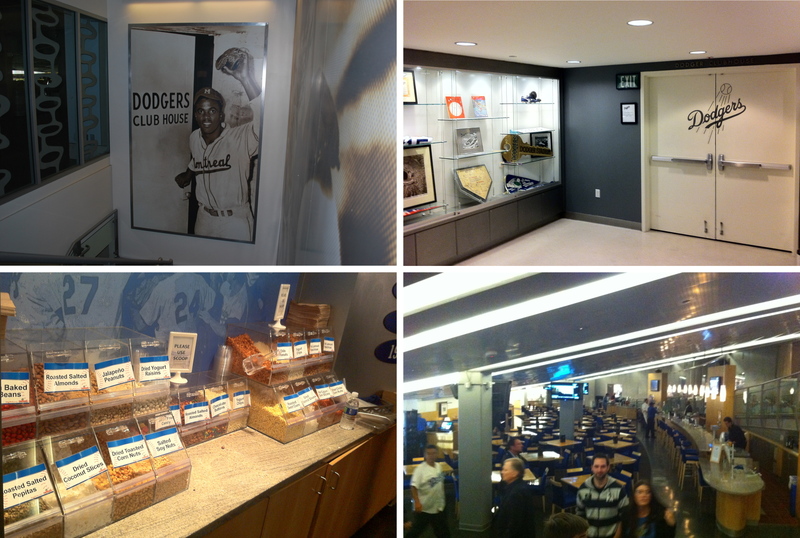 I would compare the food to the NYCE Stadium Club at Miller Park. This is just a small part of the desserts section, they also had cakes, pies, and soft serve ice cream. I had a helping of some steak, A Louisiana Hot Link (which I’ll classify as a Polish), a chicken breast marinated in teriyaki sauce, and pasta with tomatoes, pine nuts and pesto sauce. This was the view from the seats we were in. You really can’t get much better than that. The screen was a little bit of a distraction, and when it was still light out I lost some foul balls as they went skyward, but overall the seats were amazing. At one point I had a gentlemen in the first row take a picture of the four of us. From left to right you have Diane, Joe, myself, and Dustin. 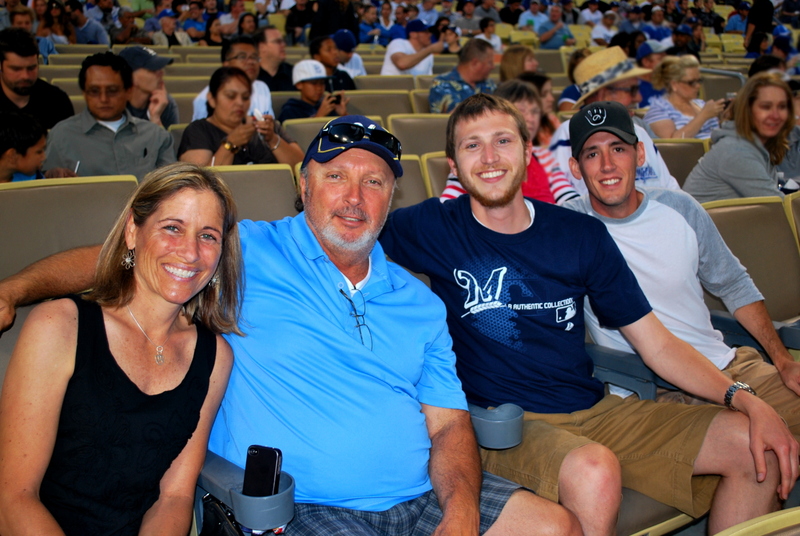 I can’t tell you how sweet it was to spend a game with Braun’s parents. They’re both extremely nice and personable, and Dustin and I enjoyed talking baseball with both of them throughout the game. Now the only reason we got the opportunity is because Braun was out of the lineup. They were offered the tickets by Braun’s agency, and since he wasn’t playing, friends and family weren’t as interested to go to the game. Luckily Joe thought of me, and also that he wanted to go to the game anyways to cheer on the Crew without Ryan on the field that night. I can’t thank them enough for extending the invite our way. 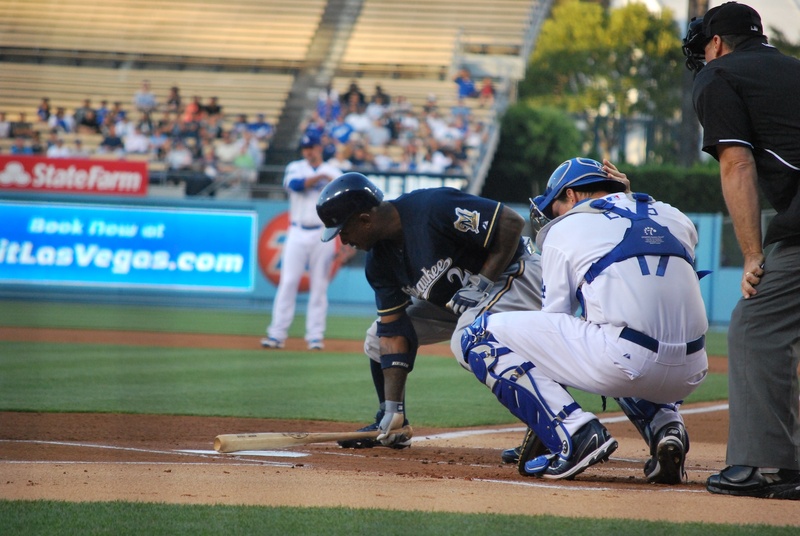 The game got started and Brewers got on the board early once again with two runs in the top of the second. A Weeks single accounted for the first, and a fielder’s choice RBI groundout by Ramirez the other. 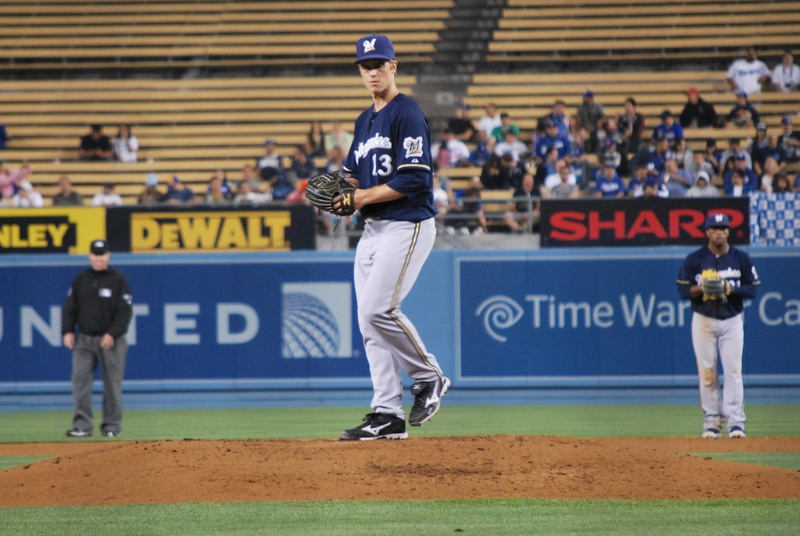 The Dodgers tallied a run in the second, but then the Brewers added two more in the top of the third, thanks to a two-run home run by Aramis Ramirez. The MLB.com game recap headline for Monday’s game was “Ram-Ram goes Bam-Bam to back Marcum”, so from now on whenever aRAMis RAMirez goes deep, I’ll be quoting that. I’ve wanted to get a good picture of Aoki doing his batter’s box routine, but missed my opportunity, he did it his first few at bats, but then not his last. It almost looks like a sumo wrestler routine with how he squats down as he’s getting ready for the at bat. This picture of Nyjer’s routine will have to suffice. He does this at least once an at bat. Greinke was the starter for Thursday’s game, and I got a picture of him as he was getting ready to deliver a pitch later in the game. The Brewers scored two more runs in the top of the ninth when Carlos Gomez took Todd Coffey (former Brewer) deep, with two outs in the frame. 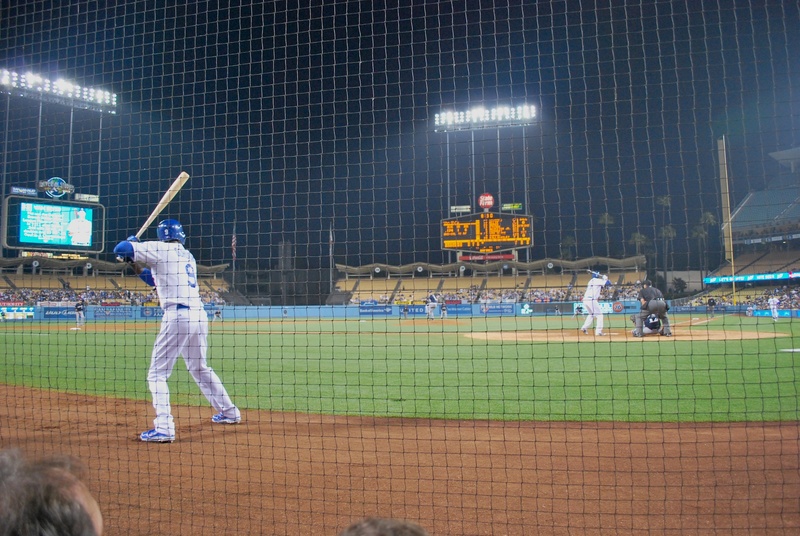 The Dodgers concluded the scoring with a run in the bottom of the ninth. 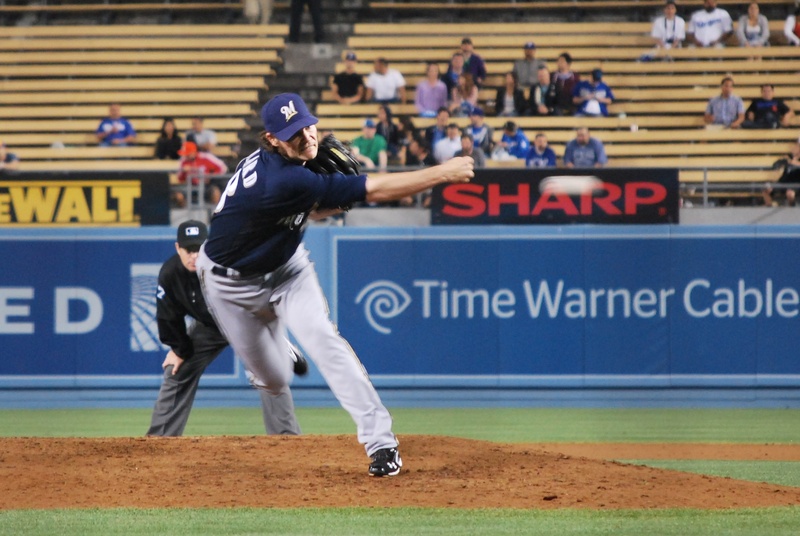 Final Score: Brewers 6 – Dodgers 2. After talking with Dillard on the field on Wednesday, I had to get a picture of him in action, right? He throws sidearm, so that is why this picture might look a little strange to the untrained eye. Dillard recorded two outs in the ninth thanks to a double play ball. The Brewers turned three in the game, and eight in the series. When you get outhit in every game but one, and still complete a four game sweep, something had to be going right. 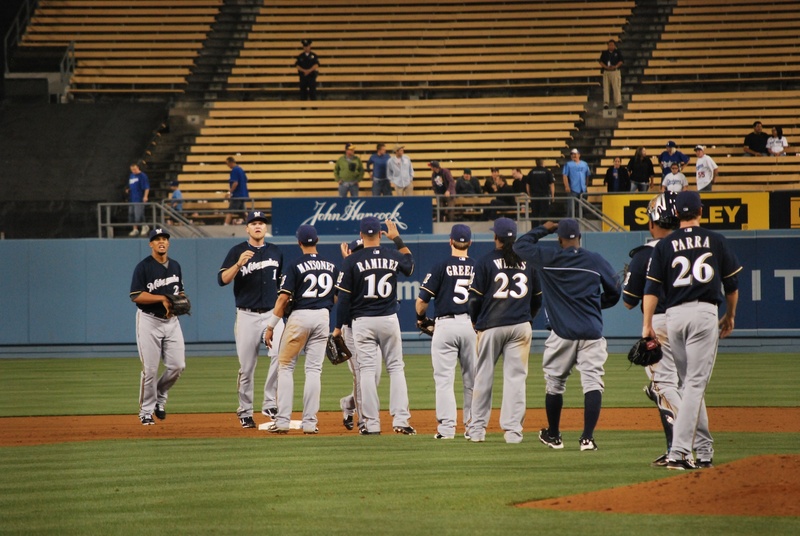 Before saying goodbye to Diane and Joe, I captured the Brewers as they gave each other the traditional post-win high fives. It’s the first time the Brewers have EVER swept the Dodgers, home or away, in a two, three, or four game series. Good stuff all around. Dustin took me to LAX and I was through security within ten minutes of arriving. I’ll detail Friday’s happenings after tonight’s game. I’m leaving in 10 minutes, so I’ve got to get a move on.